Modern apartment blocks, fast growing cities, the ever increasing tendency to try and get more into less space, has all led to cities that are gardenless. Green areas that once existed have been ravaged and replaced by concrete. Roof terraces provide much-needed outdoor space in today’s urban world. It's an idea that is quickly gaining momentum in some bigger cities. A recent study by the Greater London Assembly planning society concluded that "London's most under-used asset is just above our heads." In a smallish city, such as Málaga. A city that receives over 3200 hours of sunshine a year and where outdoor living isn't a choice, its a way of life, rooftop terraces are becoming increasingly popular. Their appeal is easy to understand. Although situated right in the heart of the city, the first thing that strikes you is the silence. High above the noise and the hustle of the city, the silence is omnipresent. The views, of course, are spectacular. Watching the sunset, or Málaga at night takes on a whole new dimension.Málaga city becomes a world of lights under the moon and stars. There’s no better way to enjoy those long summer evenings. Its been a tradition for people to get together on rooftops since the early 1980s. Rooftop terraces were places where communities and neighbours would get together to watch sporting events. Taking in a football match as if you were in the upper stands. The concept was so popular that some groups took the initiative to put on organised viewings, charging for admission and refreshments. It wasn't until the first big hotels began appearing on Málaga’s skyline that people began to appreciate rooftop terraces for their spectacular urban views. The Parador Hotel that was built on Gibralfaro was the first to offer truly exceptional views over the city. Views that were carefully sold to the public. 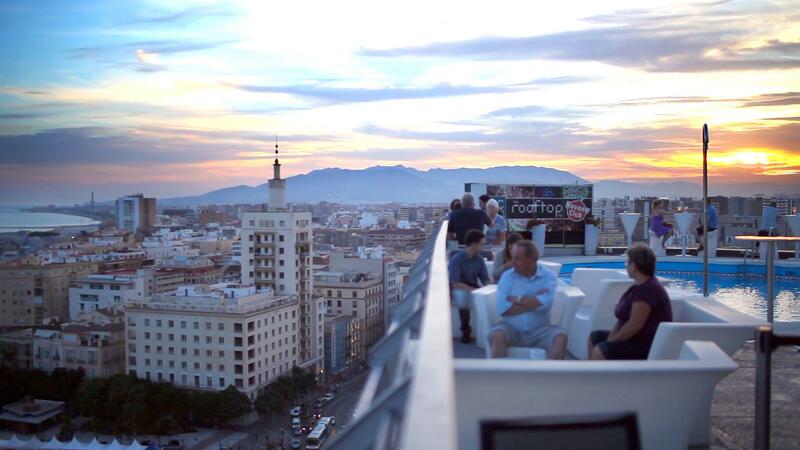 Today, nearly all of the best rooftop terraces in Málaga are owned by hotels. The AC Hotel Málaga Palacio (Cortina del Muelle, 1 - map) and the neighbouring Molina Lario (Molina Lario, 22 - map) both offer exceptional views over Málaga’s port area. If looking for a panorama of Málaga's historical centre, the Centro Hotel (Mármoles, 6 - map) and the Oasis Hostel (San Telmo, 14 - map) are the places to be. The Restaurante Alea (calle Fajardo, 11 - map) is also of note. Rooftop terraces offer the opportunity to view the evolution of the city from above, the contrast between ancient and modern architecture. A place to escape the urban jungle. 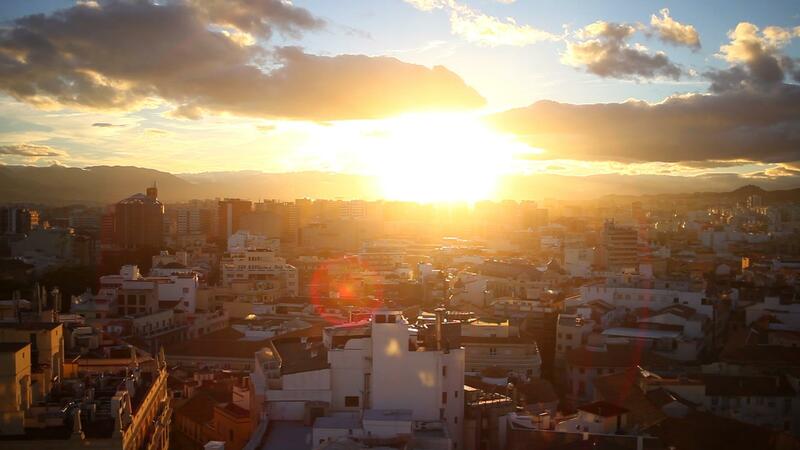 A place to relax, unwind and enjoy Málaga’s skyline and sunset. Feeling inspired? why not check out some of these beautiful holiday homes for rent in Málaga city! Find out where the best pool parties are in Marbella. The party capital of the Costa del Sol is home to some of the most famous parties in the world.. Discover the best beach clubs in Marbella, prices and what to wear. World-famous venues synonymous with glamour, parties and relaxation.